The latest update of the average (CPM) cost rate for social media advertising comparison campaign chart including ad publisher CPM revenue per every display ads, video ads, facebook, google adwords, youtube, twitter, yellow page, Instagram. 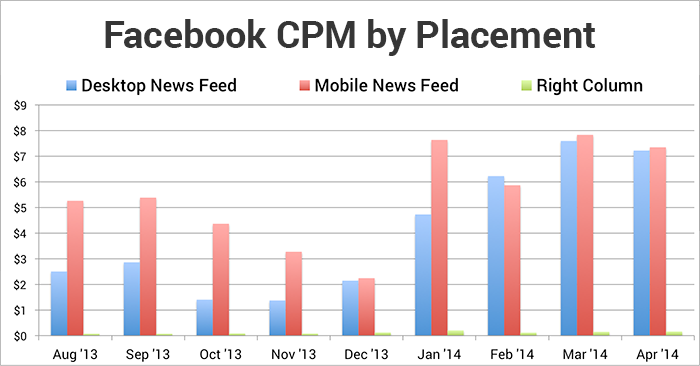 Facebook - Facebook CPM and Cost Per Page Like are evolving, depending on ad placement. Facebook is under pressure to prove it can monetize its mobile platform, and that appears to be happening. Following the success of sponsored stories, Facebook's recently introduced mobile ad product is driving greater click-through rates and CPMs for brands. Cost-per click for all Facebook ads surpassed $1 for the first time in the United States, where CPMs jumped 25 percent in the last quarter, according to a new report from social media consulting firm TBG Digital, which compiled results from 406 billion impressions in more than 190 countries. Facebook's new mobile ads are already outperforming desktop ads in click-through rates and CPMs by 14 times. Mobile newsfeed ads garnered a 1.14 percent CTR on average. Across all formats studied, click-through rates reversed a downward trend, increasing 11 percent, according to the report. CPMs jumped 58 percent from the year-ago period. 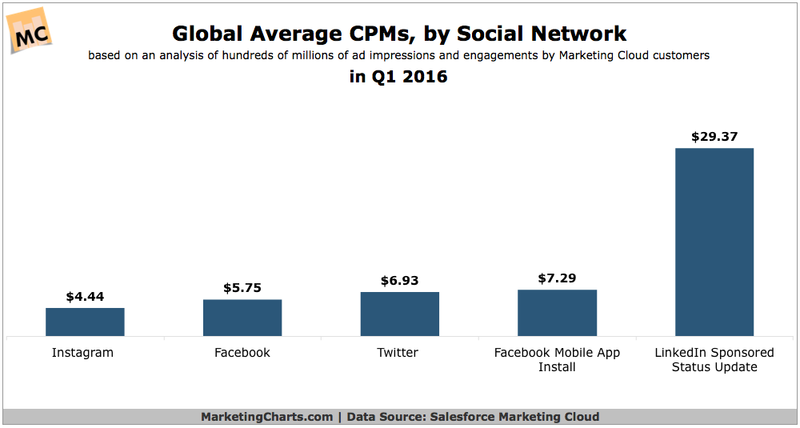 How much latest facebook cpm cost? To Pay for Impressions you need to set a CPM bid. CPM is an acronym for Cost Per Mille, and it’s the cost you pay per thousand impressions (mille in Latin means ‘a thousand’). Every time your ad is shown to a user on Facebook, it counts for an “impression”. It doesn’t matter how much or how often your ad is clicked: You pay for the number of times your ad is displayed to users by the Facebook platform. CPC pricing can be safer, at least you are paying only when users click, and if you know your conversion rate, you can set a maximum bid that will guarantee profitable results. CPM pricing is ideal when your ads are compelling and have high click through rate. You can also notice that certain ads perform better at night, or during the day: In this case pausing campaigns when they aren’t profitable and only waste impressions would be wise. 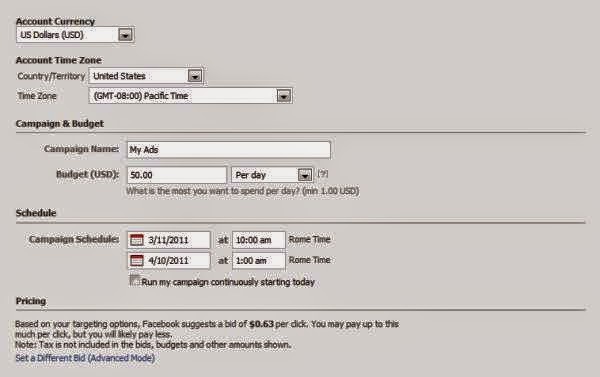 The problem is that Facebook doesn’t allow day parting, and you have to pause and resume campaigns manually. If you need to manage large campaigns or multiple campaigns that would benefit from automatic day parting, SAT is a Facebook advertising tool that would allow you to save time and run campaigns more effectively. Therefore the reports come out regularly that give us an idea of the trending costs and performance of Facebook ads. They are interesting, but they are nothing more than a mash-up of hundreds of advertisers. How much were those advertisers spending? What were they promoting? What were the sizes of their potential audiences? Were they using CPM, CPC or oCPM? Were their ads effective? The digital marketing campaign sites, released the benchmark advertising cost comparison chart for social media ads (CPM) average purchase rates per industry. The Facebook average cost per engagement rates increases up to 70% from original prices including both track on (CPM) base and (CPI) cost. Metrics judgment based on benchmark banner, video, news feed and mobile app demand marketing effectiveness of investment activities. The cost-per-install (CPI), meanwhile, averaged $3.82, up 35% year-over-year. These reports are good for entertainment purposes. They can even provide a lightbulb moment, inspiring you to take a second look at your ads. The median cost is a bit misleading given the way costs are trending for me. Currently seeing a cost of $.80 per page like in the sidebar, which I cannot continue to spend. mobile is currently easily to bid the most affordable social ad placement. Let’s also keep in mind that this comparison campaign ad may simply be less effective now. We can’t ignore that possibility. To continue to refresh them monthly. But generally, I’m seeing an increase in costs for page likes on desktop (especially for sidebar) while mobile is now more attractive. Overall, while CPM has doubled or tripled for my ads, the cost for Page Likes has increased but not at that rate. Facebook advertising appears to be getting more competitive, but oCPM is optimized to the point where the increasing CPM costs are not resulting in huge increases in costs for Page Likes. Social Media CPM depends on two main factors: 1) how many fans you have & 2) how much it costs to manage your social media. For the purpose of this article, we’re going to use our customer’s real numbers and give you an average. Local businesses can have only 100 or well over 1000 fans. Marketing agencies can charge $1,000 to several thousand dollars per month to manage social media. Do-it-yourself models can cost far more than you think once you’ve realize what it takes to do social media well. Or once you’ve calculated what your time is really worth. All of this makes our model pretty simple to figure out with a fixed monthly price where you know exactly what you’re going to get. The average CPM for our customers with less than 300 fans is $10-15, right in line with radio. The more fans you have, the more impressions you get. Customers with 1,000+ fans have a CPM around $1.50 – far less than any other form. And again, these are highly impacting impressions. Impressions that your customers will interact with, share, and remember. What Is a Typical CPM in Social Media? Social media marketing is a relatively new marketing tactic. Marketers often track both the CPM and the CPI, or cost per interaction, for social media, and they use both metrics to judge the costs and effectiveness of their marketing efforts. The average CPM for social media banner advertising is $1 to $4, but the price can vary considerably. Highly competitive keywords often cost more. The trick to getting the costs down is to find unusual and targeted keywords that cost less. Therefore Siteadwiki concluding that the average CPM social media its depend upon you if how much you spend per ad campaign whether you select cpm, cpa, cpl, cpc, cost.